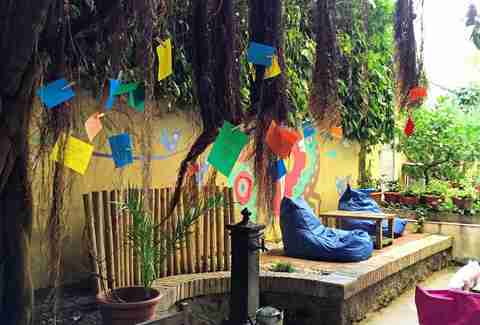 Staying at hostels was once a backpacker’s rite of passage. After all, nothing builds character like fighting for power outlets, showering in shoes, and trying to fall asleep to the sweet sounds of an Australian couple doing hot romance in the bunk above you. That’s all changed though, and hostels have really upped their game in the last few years. In fact, some you can't even differentiate from hotels these days. And since we already told you about the seven best hostels in the United States, this time we wanted to turn our sights across the pond. 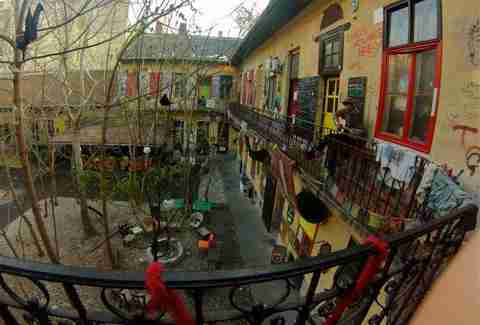 Here are some of the coolest hostels in Europe. 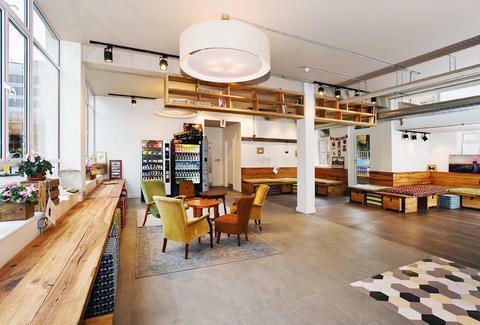 As the name suggests, this hostel can be found in Amsterdam’s trendy Noord neighborhood just a scenic ferry ride from Central Station (a 24/7 service, and it’s totally free). Rooms are bright and modern, right down to shampoo and shower gel with funny slogans. Noord’s also way more laidback than the rest of Amsterdam’s downtown tourist hustle -- here you can cozy up next to locals in bars and cafés overlooking the water. Designed by graphic artists, City Circus is everything you could ever want in a funky design hotel. It’s kept the fresco and baroque tiles from its days as a mansion, sprucing up the walls with dynamic art and quirky Dada prints. While it's located in Psirri, Athens’ prime nightlife neighborhood, it also boasts a rooftop bar with a killer view of the Acropolis lit up at night -- so you can keep the party close to home. 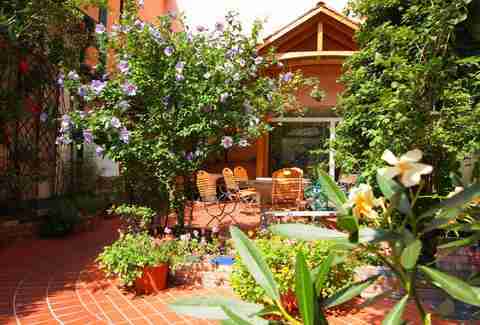 Casa Gracia may be a hostel, but it has the DNA of a Spanish countryside inn. Despite being six-stories spacious, the property feels totally intimate with a big common area and an open kitchen serving homemade cakes and tapas. You’ll want to stay here just for the Sunday Brunchmut, a boozy feast with lots of the famous local vermouth. The hostel also has a range of delightfully hipster activities throughout the week too, from cocktail workshops to yoga and even tango class. If The Lonely Island’s “I’m on a Boat” was once your spirit song, you need to stay at the Eastern Comfort. 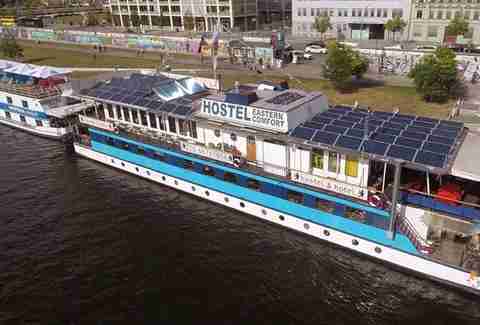 This hostel floats on the Berlin’s charming Spree River, which also happens to conveniently sit between the city’s two big party districts. Cabin rooms are cozy and surprisingly open, although there’s always the option of camping under the stars on the upper deck. During the day, there’s also a great view on the historic Oberbaum Bridge and the East Side Gallery (otherwise known as what’s left of the Berlin Wall). 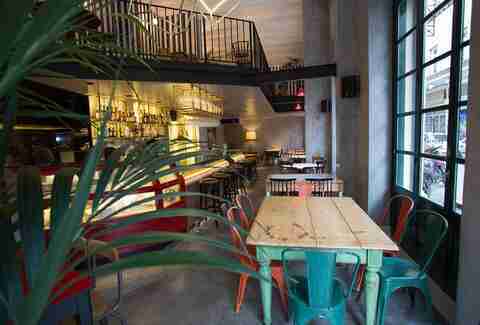 If you’re looking to recreate The Hangover in Budapest, checking in here is a good start. Seriously, there’s even a bunk bed overlooking a beaming Mike Tyson on the wall. Grandio is known not just for its themed rooms, but for one of the city’s best ruin bars, an outdoor garden decked out in mismatched furniture and graffiti art. More than a few games of beer pong have gone down here, and the staff is known for showing guests a good party around town. It would usually be wrong to recommend a hostel with its own tattoo studio (because, bad decisions), but consider Urban House a glorious exception. It’s got all the makings of a hostel, except with coveted perks like lots of power sockets, private showers, and free lockers in every shared room. Bunk beds are only a stumble away from the restaurant and bar, where craft beer, cocktails, hotdogs, and burgers abound. As for the tattoo shop, it’s popular so booking an appointment is necessary (so tell your party self not to worry). There’s a rooftop Jacuzzi. Need we say more? 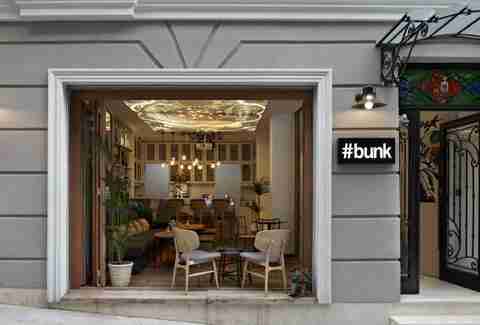 Bunk Beyoglu’s sunbathing deck and bar is what Instanbul summer dreams are made of, but just wait ‘til you see the rest of the hostel. While rooms are clean and simple, you’ll probably spend a lot of time hanging out in the ground floor café. Sip your choice of Italian espresso or Turkish coffee, while sitting at marble tables surrounded by old radios and record players. By night, it becomes the neighborhood’s liveliest bar. 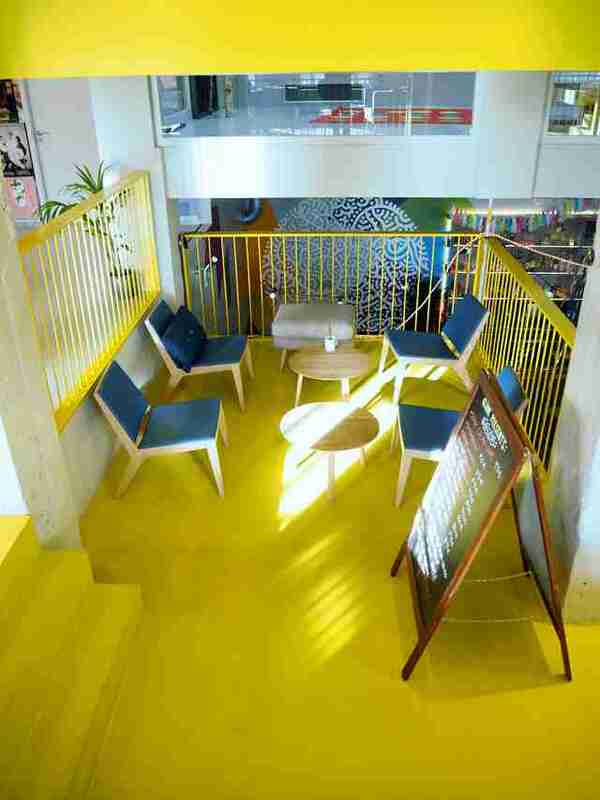 The Independente is a hostel that thinks it’s a hotel, and we’re totally OK with that. 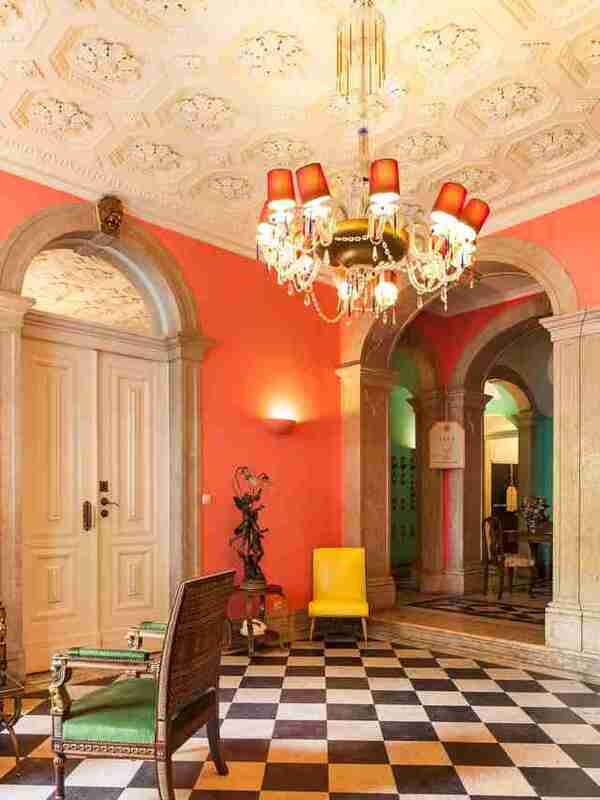 Once the mansion of a former ambassador, it’s got old world, vintage charm for a very decent price. From the reclaimed furniture to checkerboard marble floors and stained glass, it’s clear a lot of love went into the ambience. The on-site restaurant Decandente also does tasty yet Instagrammable Portuguese dishes for a reasonable price. 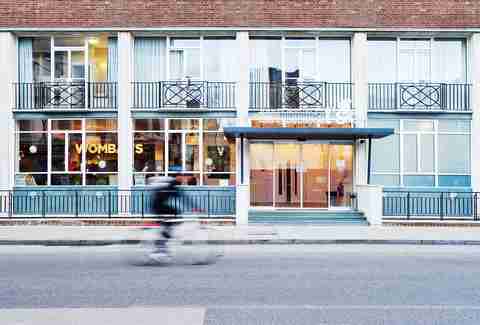 Wombat's is a hostel chain across Europe that’s known for being mighty reliable, but its location in London is a definite standout. The building was a seamen’s hostel in the 1860s, and Joseph Conrad (Apocalypse Now, people) once stayed here. With 600 beds, this is one of Wombat’s biggest locations so getting booked in shouldn’t be a problem. Rooms have been significantly spruced up since its nautical days, with comfy wooden bunks and free hair dryers on request. Exploring Madrid in balmy weather can definitely take its toll, but not with a place to stay like U Hostel. It’s a refuge made of simple pleasures, from the small complimentary breakfast to beds with individual reading lights and private lockers. Rooms are cozy but modern, mostly white with bursts of vibrant color. But chances are you’ll end up hanging out in the cinema room, burrowed into a pile of nice comfy cushions. 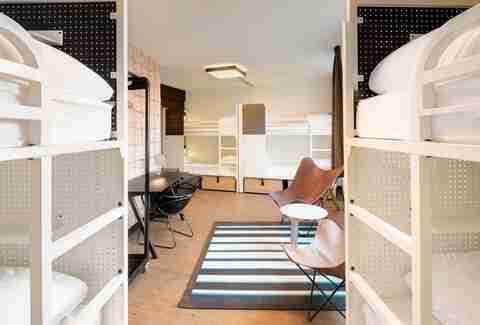 Paris’ Generator may be the definition of a mega-hostel -- 920 beds, no joke -- but it’s a well-oiled machine that’s très chic. Its lux design includes art-house neon lights and cement accents, but all tokens of a traditional hostel still reside -- foosball, ping pong, old books, and the like. Shared rooms also have enough USB ports and outlets to keep even the most digital of nomads very happy. Mosaic House’s claim to fame is being the first sustainable, eco-friendly building in the Czech capital. It’s a funky hostel -- you’ll know you’ve arrived by the giant mushroom statues out front -- and there’s modern art in both shared and private rooms. 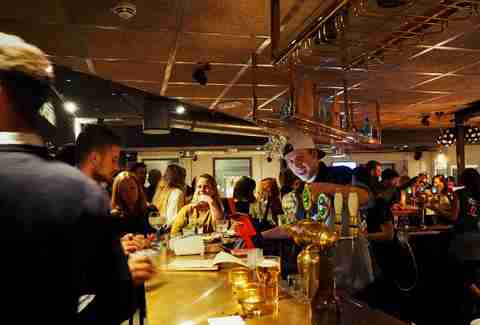 Mosaic House is close to the hustle and bustle along Vlatva River, but starting the night at the hotel bar is a good idea -- there are DJs, karaoke parties, and even lip-sync battles for the tonally-challenged. If you’re looking for a hostel in which to fall asleep drink in hand next to a heap of pizza, this isn’t it. 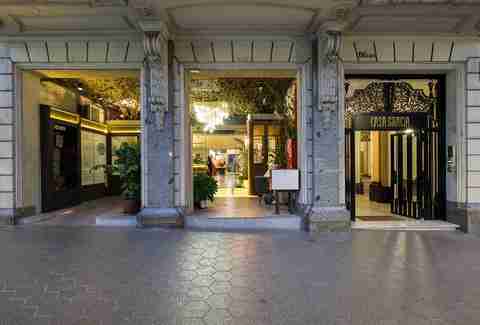 Beehive doubles up as a holistic retreat, which is not to say you have to take part in yoga or try the vegetarian café -- but it does offer a little quiet in a city that’s as hectic as Rome. Shared rooms start at $27 and considering all the organic amenities, from soaps to shampoos and even the linens, you could definitely say it’s a deal. 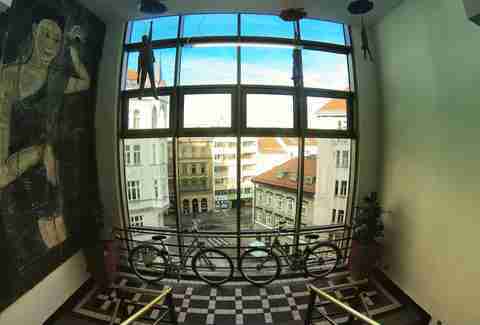 Hostel Ruthensteiner is one of Vienna’s most revered hostels, and with good reason. Rooms are simple and elegant, with two lush gardens where chilling out or trying the giant wooden chessboard is a must. Ruthensteiner’s personal touches like bike and iPad rentals, and free WiFi/printing (yes, people still print stuff out!) definitely make the life of a globetrotter a little bit easier. Barbara Woolsey is a Berlin-based writer who wants to challenge you to a hostel lip-sync battle. Follow her adventures around Europe on Facebook and Twitter.